Where are Parish Registers Available? With the use of computers becoming more widespread, almost everyone has a computer in their home nowadays. This means that companies specialising in genealogy and family history are putting scanned images of the registers onto CD-ROM for people to purchase, or making the records available online. S&N Genealogy Supplies is an expert in this area. With over a decade of experience in serving the needs of family historians, the company produces quality products from scanned books, microfiche and microfilm. If there is a page that is missing, then that page has been located and included on the CD, and each page has been scanned several times to get the best result. They also have the records online, making them available to people through a subscription or pay-as-you-go service. These records are available at TheGenealogist.co.uk. To view more information about viewing the records on CD, click here, or to find out more about online subscriptions and services, click here. The original parish registers are usually stored in a county record office. These can be viewed by the public, but the archivists are reluctant to allow handling of these old and unique books. 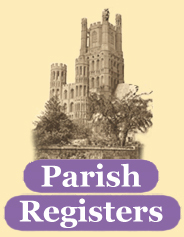 The best way to view Parish Registers is either online or on CD.